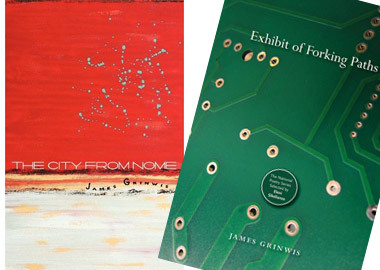 James Grinwis started circulating a poetry manuscript around 10 years ago, just after grad school at Umass-Amherst. Even then, it was clear that his sensibilities were unusual. That made his poems zing with surprise, with slantwise looks at the everyday that added up to something that read more like an image-drenched dream. That is, of course, a fine thing indeed if writing poetry is your primary goal. In his case, circumstances point toward a conundrum of artistic experimentation: Grinwis’ manuscript apparently didn’t appeal to the editors who publish works of poetry, probably because of its unusual sensibilities. Those editors—certainly fickle as anyone—didn’t seem to notice the sophistication of his writing for a long time. When one of them finally did, earlier this year, Grinwis had already completed and begun circulating a second manuscript which surpassed the first in its singularity of vision. Within a few months of the first manuscript’s acceptance, the second one got the nod as well. That unusual circumstance instantly vaulted Grinwis into the rarefied territory of poets with multiple titles to their credit, and starkly outlines the space in which his poems live. Grinwis tells me he’s fascinated by the worlds of science and poetry. Unlikely bedfellows, perhaps, but fertile territory. His second book, Exhibit of Forking Paths (published as part of the National Poetry Series), spools out an unlikely premise, succinctly explained on the back cover: “An elegant fusion of poetry and circuitry.” Grinwis took as inspiration the graphic symbols found in circuit diagrams. Unencumbered by a complete knowledge of the symbols’ scientific meanings, he often takes them in literal directions, describing them as if they were strange representational drawings. Where an electrical engineer might see an indication of routing and transforming of current, “I saw things like characters crashing into each other,” he tells me. The poems that take the symbols on in that manner play out, in Grinwis’ usual surprising fashion, the kind of “a-ha” moments of optical illusions and visual puzzles. In others, the symbols inspire mini-narratives, spelled out in prose poems. For Grinwis, the long search for publication occasioned a lot of thought about how poetry manuscripts take shape. He tells me he enjoys prose poems (in which line breaks are only brought about by hitting the margin, as in regular prose) and micro-fiction, and in Exhibit of Forking Paths, prose poems, electrical symbols, white space and traditional poems all come into play, offering a surprisingly visual voyage. It’s not happenstance—Grinwis was keenly aware of the elements at his disposal. He tells me he took his manuscripts apart and re-assembled them repeatedly, looking for the right order. For Grinwis, of course, shepherding two books into print required a lot of patience and a lot of self-confidence in the face of rejection. The results, on the other hand, offer an unusual chance to see, in short order, the evolution of a poet and his concerns.